Question: I forgot Windows XP Password and now I am locked out of my computer, is there any way to bypass Windows XP Password? Answer: Don’t worry – if you forgot Windows XP password, there are many methods you can used to find a Windows XP password. Method 1: Try To Guess your forgotten Windows XP Password. Don’t laugh! You’d be surprised how often this works. So, before you jump into any high tech windows password recovery solutions, try your hardest to remember what your forgotten Windows XP password may have been. Most passwords, even complicated ones, are often tied to common things in our life, such as people, places and things in our personal and professional lives. Could your Windows XP password have had anything to do with? Your name or the name of your friend or family member? Your birthday or your loved one’s birthday? Your Windows XP password reset disk will still work even if you’ve changed your Windows XP password since creating the disk. Follow these steps to reset Windows XP password. Step 1: Click use your password reset disk. The Password Reset Wizard starts. The Password Reset Wizard allows you to create a new password for your user account. Then click Next. Step 2: Insert your password reset disk into drive A, and then click Next. Step 3: Type a new password in the Type a new password box, then confirm the password. Click Next. Step 4: Click Finish. The Password Reset Wizard quits, and you return to the Windows XP logon screen. If you have other user accounts on your computer, one of them may be setup with administrator level access. This means that you can log on with this account to change your forgotten Windows XP password. If you still can’t recover Windows XP password from the above methods, then it’s time to try something a bit more technical. 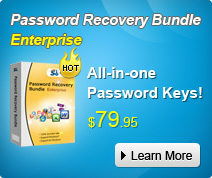 Step 1: Download and install Windows XP Password Recovery. Method 5: Still Can’t Find Your Windows XP Password? If you still can’t find windows XP password, even after using the Windows password recovery programs linked above, you will need to perform a clean install of Windows XP which will erase everything on your PC.